The conversation surrounding illegal immigration is deeply personal for many people—it is emotionally-charged, raw, and politically divisive. Debates often devolve into mud-slinging competitions, and arguments morph into feigned outrage or violent protests. But from an economic perspective, the question is settled science: illegal aliens cost taxpayers billions, impoverish American workers, and are completely unnecessary for America’s economic success. To begin with, illegal immigrants are expensive. According to the Federation for American Immigration Reform’s 2017 report, illegal immigrants, and their children cost American taxpayers a net $116 billion annually—roughly $7,000 per alien annually. While high, this number is not an outlier: a recent study by the Heritage Foundation found that low-skilled immigrants (including those here illegally) cost Americans trillions over the course of their lifetimes, and a study from the National Economics Editorial found that illegal immigration costs America over $140 billion annually. As it stands, illegal immigrants are a massive burden on American taxpayers—and so are low-skilled legal immigrants. Although border control is a federal responsibility, state and local governments shoulder two-thirds of the costs associated with illegal immigration. Unsurprisingly, this costs California more than any other state: California spends $30.3 billion on illegal aliens annually—17.7 percent of the state budget. Texas is next: illegal immigration costs the State of Texas $12.4 billion annually or roughly 10 percent of the state’s budget. In third place is New York, which spends $7.4 billion on illegal immigration. Of course, the tax burden is only part of the story: illegal immigration also distorts the labor market, hurting American workers. Ever hear of the law of supply and demand? It is how the free market determines prices: when demand increases, prices increase (more people bid-up the price); conversely, when supply increases, prices decrease (less scarcity means less urgency), and vice versa. Supply and demand underpin the price of everything from gasoline, to apples, to the value of a person’s labor—surgeons command high prices because there is a limited supply of surgeons, whereas store clerks make minimum wage because anyone can be a store clerk. According to Pew Research, illegal immigration has flooded America’s labor market with at least 12 million new workers. This has dramatically, and rapidly increased the labor supply and therefore decreased wages for American workers. Ample evidence supports this claim. For example, before Hurricane Harvey President Trump’s crackdown on illegal aliens had already caused wages for construction workers to rise by 30 percent in Texas (half of Texas’ construction workers were illegal aliens). In light of recent events, their wages will likely rise even higher—but we can still attribute a significant portion of said rise to labor market constrictions. Likewise, businesses in Maine were forced to hire American workers after the availability of visas for temporary foreign workers were restricted. As a result, unemployment decreased, wages increased, and working conditions improved in order to attract American workers. Illegal labor has distorted America’s labor markets, and hurt American workers in the process. Finally, America’s economy will not collapse without easy access to illegal labor. The standard refrain can be summed up as: “we need illegals to do the jobs Americans won’t do.” This is nonsense for two reasons. First, the claim is predicated on the false assumption that America’s labor market is saturated and requires more workers to continue growing. This could not be further from the truth: right now fewer than 150 million Americans (out of 320 million) are employed, likewise, there are 23 million Americans currently looking for work—twice the number of illegal aliens in the country. Even if we assume that every illegal alien was employed, replacing them with American workers would still leave 11 million Americans unemployed. Second, the claim is undermined by actual labor statistics. According to the Bureau of Labor Statistics, millions of Americans—of all races—currently work as janitors, laborers, and agricultural workers. In fact, only four percent of American agricultural workers are illegal aliens, according to a report in the National Review, putting to bed the myth that we would starve without illegal laborers. Clearly, Americans are willing to work any job, provided they are compensated at fair market value—this is not currently happening precisely because many illegals work under-the-table. Believe it or not, states without illegal immigrants, like Montana or Ohio, are not economic backwaters with exorbitantly high costs of living—people in Idaho can still afford McDonald’s and Starbucks, they just pay teenagers to work the drive-thrus. 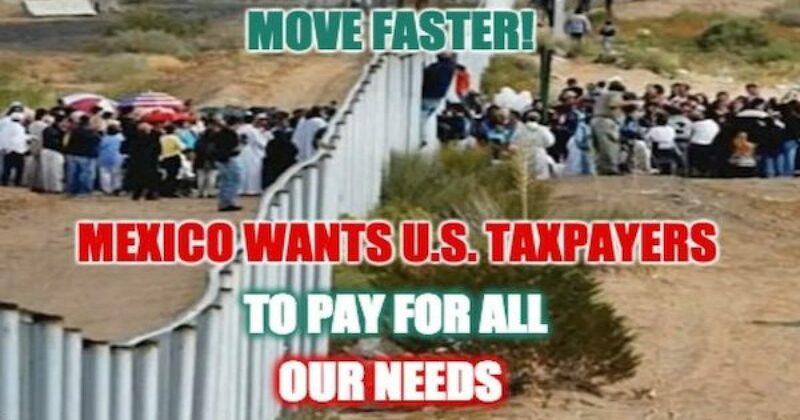 In fact, the cost of living in said states is often cheaper, because their governments do not require high taxes to subsidize legions of illegal aliens. It is also worth mentioning that America is the only developed nation, until very recently, that imports millions of illegal immigrants to work in its service sector—other rich nations like Japan and Canada, do not. Yet despite this, the GDP per capita of Japan has actually grown faster than America’s during the same period. The same is true of Canada and Australia. If illegal immigration is such an economic bonanza, why are we being left behind by states without this “advantage”? University professors, Silicon Valley CEOs, and politicians are not losing their jobs to illegals—ordinary folk bears the economic costs. I have a sneaking suspicion that if all illegal aliens were news anchors and senators, America’s border would look like Washington DC’s gated communities.